Tag Archive | "White Creek"
Whose pothole is it anyway? 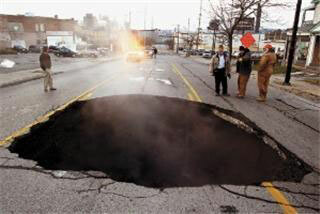 A dispute over legal boundaries has left motorists dodging a crater in the middle of the road and no one to appeal to. A pothole at White Creek and Shady Lane has been steadily growing this winter, in part due to an underground spring. The other reason is lack of road maintenance. And that won’t be remedied anytime soon, because the pothole is—quite literally—in no man’s land. With road budgets dwindling and projects being scaled back, the city and townships began looking at critical areas to repair. While looking at this particular intersection, the city discovered that due to a legal technicality, it was not included in the 425 agreement with Solon Township and therefore not in the city’s jurisdiction. Kent County was contacted to see if they could help repair the road, but they said they don’t have the money for anything north of 14 Mile Road. A new community group called the “Shady Lane pothole initiative” is looking for donations of cash to help solve the problem. They plan to hold a meeting on Tuesday, April 1 at a local tavern to discuss whether to use the cash to fill the hole or use the money to pay for their drinks. Cedar Springs Police and Cedar Springs Fire and Rescue responded to a two car accident at 17 Mile and White Creek Ave about 6:13 p.m. Sunday, August 11 that involved seven people. According to police, Kerry Jean Eggebeen, 29, of Cedar Springs, was heading eastbound on 17 Mile in a Dodge Van, when she attempted a left turn on to northbound White Creek and struck a westbound Honda Civic. The Civic was driven by Elizabeth Marie Cutler, 34, of Sand Lake. Both drivers noted that the traffic light was green. Eggebeen was cited for failure to yield right of way at an intersection. 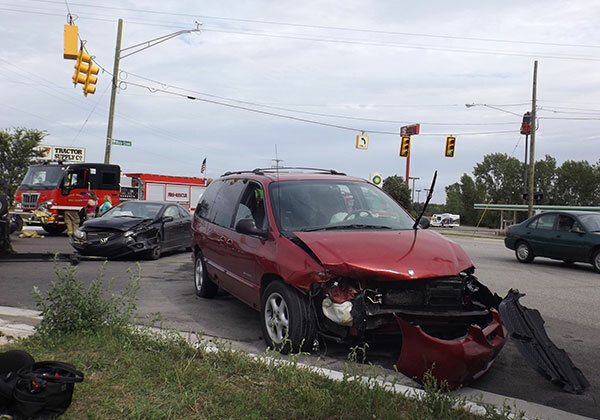 The Dodge Van was carrying three passengers, and the Honda Civic was carrying two passengers. One passenger was treated at the scene but no one was transported to the hospital. The Kent County Sheriff Department is looking for a man that broke into a home on White Creek Avenue in Solon Township Monday morning and then assaulted an elderly relative who arrived on the scene. According to Det./Sgt. Marc Burns, a 77-year-old relative of the homeowner arrived at the house in the 17000 block of White Creek Avenue, near 20 Mile Road, about 11 a.m., as the suspect was exiting the home. The suspect attacked the victim, and then fled with several items from the home. The victim was transported to the hospital with serious injuries. The suspect is described as a black male, 30-35 years old, approximately 6 feet tall, with a large build. The vehicle he used was described as a gray, newer style passenger car. Anyone with information about this incident or suspect is asked to call the Kent County Sheriff Investigative Division at (616) 632-6125, or Silent Observer at (616) 774-2345.